Ecuador set a new Guinness World Record over the weekend when tens of thousands of citizens heeded the government’s call to plant more than 640,000 trees in a single day. “This news makes me very happy, it shows our ecological commitment,” President Rafael Correa said during his weekly radio show. The initiative was called “Siembraton,” a play on the words, "sembrar," Spanish for sow, and "maraton," or marathon. Correa wanted to draw attention to deforestation in Ecuador, one of the world’s most biologically diverse countries, but also one afflicted by one of the highest deforestation rates in South America. 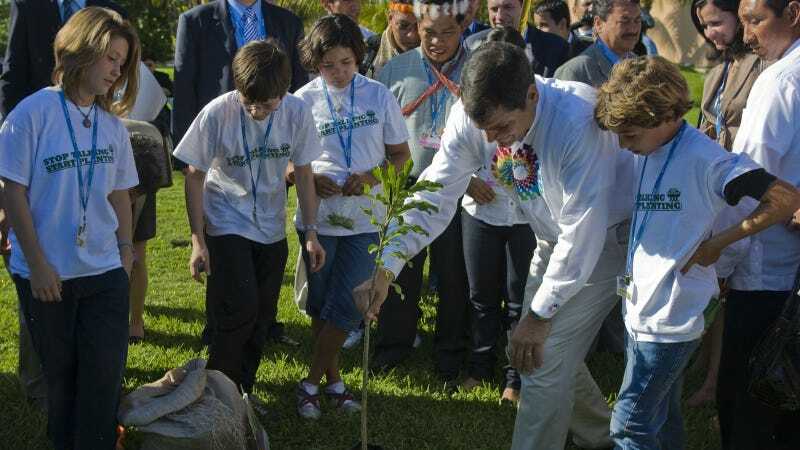 Ecuador's Environment Minister Lorena Tapia said more than 40,000 people planted trees across the country. The new trees were placed over 2,000 hectares of land, according to the government. But some environmental groups, which by and large welcomed the move, also pointed out that new oil exploration being backed by Correa in Ecuador's Amazon rainforest region could more than nullify any impact from the new trees. “It’s great that Ecuador is planting trees, but its proposed new oil drilling would likely deforest a swath of rainforest that is nearly 100 times the size of the area where it planted saplings on Saturday,” said Adam Zuckerman of the conservation group AmazonWatch. Zuckerman was referring to Correa's decision to allow oil drilling in a wide swath of Ecuador's Amazon, including the Yasuni National Park. The park is one of the world's most-biologically diverse and home to one of Ecuador's last indigenous communities living in voluntary isolation. It also sits on hundreds of millions of barrels of oil. In 2007, Correa launched a plan to protect the jungle area, seeking $3.6 billion in contributions from the international community to protect the park from oil exploration in a plan to that drew support from actors Leonardo DiCarpio and Bo Derek. But Correa eventually scrapped the idea after it attracted only $13 million in donations. The plan to allow oil drilling has triggered protests from indigenous groups and environmentalists. Correa has said the oil earnings will help to alleviate poverty in the country. He's vowed any environmental impact will be minimal, and drilling will only affect 0.01 percent of the Yusani. "Those half-million acres that drilling would destroy are crucial to the indigenous peoples that call it home, the Amazon's ecosystem, and our global climate," Zuckerman said.